Da Nang (VNA) - A section of My Khe beach in the central city of Da Nang, considered one of the most beautiful stretches of coastline in Vietnam, has been heavily polluted by untreated waste water illegally discharged from a construction project. Deputy Director of Da Nang’s Department of Construction Le Tung Lam said the 27-storey Royal Era 1 building had pumped waste water from its on-going excavation of basement floors into the city’s household waste water treatment system. However, the treatment system was overloaded with waste water discharged from the project, and could not treat the overflow. The project investors, the TMS Hotel Da Nang Joint Stock Company, and the building contractor Hong Tri Viet Company connected the site with the city’s waste water discharge system without permission from the administration. “We stopped the project on August 4. Wastewater from the project had spoiled the beach of My Khe through the My An discharge outlet,” Lam said. “The department, in co-operation with relevant agencies and the district of Ngu Hanh Son, will strictly supervise the project and the investors will only be allowed to discharge waste water from the construction site when they get approval from the city,” Lam added. 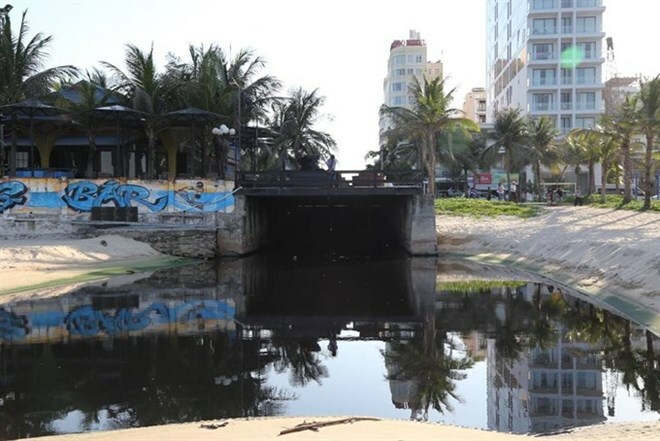 He said the department asked the city’s natural resources and environment officials to inspect the illegal discharge of untreated wastewater onto Da Nang beaches. The central city has been struggling against waste water discharge from industrial zones (IZs) and urban sites. According to the city’s Institute for Economic and Social Development, only 70 percent of waste water from IZs is treated before being discharged into the environment, and even that is at level 1 (liquidation of organic matter). Meanwhile, urban untreated sewage is still discharged directly into 28 lakes out of 30 in the city daily, while rain and untreated household waste water is collected in the same pipe and sewage system before flowing into the sea. Untreated sewage has also spoiled other beaches with waste water from households and seafood restaurants. Da Nang presented a 115 million USD budget proposal, of which 100 million USD is to be funded by the World Bank, for upgrading waste water treatment stations, waste water drainage systems and drainage channels in the city.